« Pat McManus Band, Steve Hill and Kenny Wayne Shepherd…in a week! 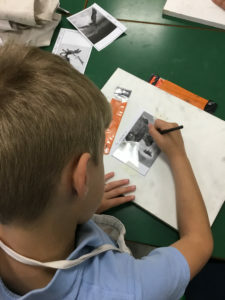 My recent application to the Big Lottery Fund has enabled me to attend Moorgate Primary School on Tuesday and Wednesday to deliver Art Workshops. 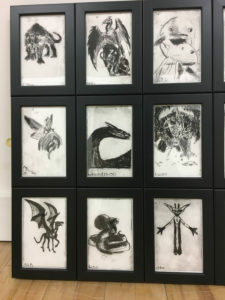 Working with a Year 6 group the children were encouraged to work with “dry-point” to explore intaglio printmaking. The pupils worked extremely well, producing work of a very high quality indeed! Huge thanks to Big Lottery Fund for making the funds available, Mrs. Heyes for co-coordinating the day, Miss Anwar and Mrs. Baron for being so accommodating, Mr. Mansfield for his assistance during the workshops, Chris Rivers (Artist) for helping me throughout the day and of course Year 6 who were quite simply superb! 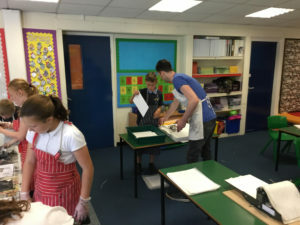 The pupils behaved and responded in a such a way that they were a credit to the school, to their parents and to themselves. Well done Year 6! 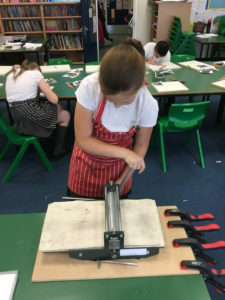 Year 6 pupils busy at work inscribing the plates….you could have heard a pin drop such was their concentration! 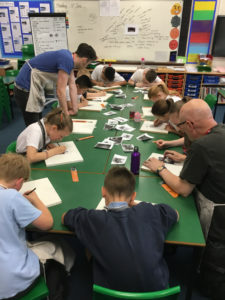 It was great having Chris Rivers to help me throughout the workshop…here we can be seen providing a little guidance to the talented young artists from Moorgate Primary school. An engineer’s scriber is used for inscribing a groove into the polypropylene plate. 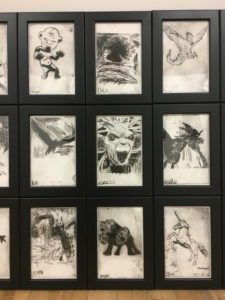 Many printmakers will use a dry-point to do this but I prefer an engineer’s scriber…they have a knurled surface on the handle for improved grip and the point has a long taper providing a better view of the plate than traditional “artists” dry-points. These grooves can be cross-hatched to produce a variety of tones. Once the image has been inscribed into the plate the plate is ready to be inked. Card (mounting card) is used to force ink into the grooves. The card is then used to remove surplus ink from the surface of the plate. We only want ink in the grooves so the surface of the plate needs to be wiped clean of ink. Following the card, scrim is used to gently remove ink from the surface and then scrap tissue paper is used for the final wipe. “Bread and butter” paper is being removed from the water tray in this photograph. It had been soaking for at least twenty minutes making it soft enough to be forced into the the grooves of the plate when it is put through the press. The paper lifts the ink from the grooves and gives us our print. Before printing, the paper is placed into the “wet” blotter to remove excess moisture. 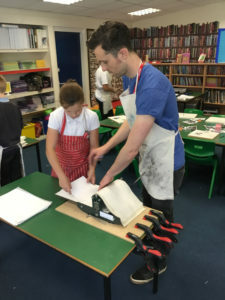 Artist Chris Rivers can be seen about to open the blotter with his right hand for the pupil to place his paper in between the blotting paper. The plate is placed face up on top of a sheet of tissue paper on the bed of the intaglio press. The softened bread and butter paper is placed over the plate, a second sheet of tissue paper is then positioned over the bread and butter paper, blankets go over the top and we are ready to pass the plate and paper through the steel rollers of the intaglio press. By turning the handles the rollers are rotated and the bed passes between the rollers….pressure squeezes the paper on top of the plate pushing the soft and pliable paper into the grooves thereby lifting ink from the inscribed grooves. The paper is removed from the press and placed into the “dry” blotter. Once the paper is dry the print is ready to be trimmed to size and framed for exhibition….. 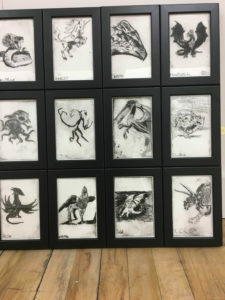 The dry-points have been dried, trimmed to size, framed and mounted ready for exhibition at the school. 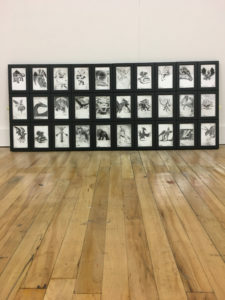 Please see below for a closer look at this outstanding bank of work! 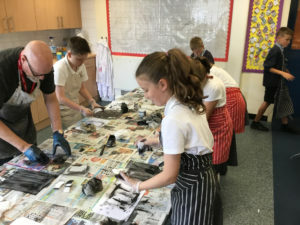 Fantastic work by Year6 Moorgate Primary School pupils!! !